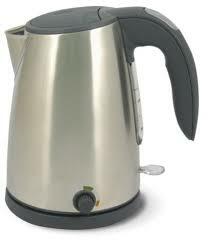 The best characteristic of the Adagio Utilitea kettle definitely has to be its patented temperature control system that keeps you at a specific temperature when steeping your perfect brew or reaches boiling point if it is water you need heated up. It’s made from stainless steel and tough plastic for the handle that stay cool even with temperatures of up to 180 on the inside. You will also love the 360 degree base that allows for cordless serving.